The above info came from Li Lin, and was edited by yours truly (contact me). The image came from Anime Saguenay. 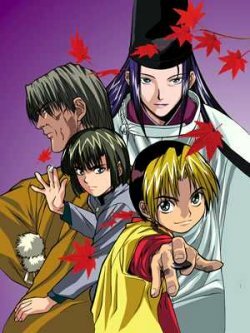 Hikaru No Go is about a boy named Shindo Hikaru and a spirit named Fujiwara no Sai. Sai was once a great Go player, one of the greatest in history, but killed himself after he lost a rigged round of Go (Go is a Japanese game of strategy). Since then, he has been trapped inside a Go board. Then one day Hikaru finds a Go board up in his grandpa's attic and notices a blood stain on it. Oddly enough, the only one who can see the stain is Hikaru. Hikaru repeatedly tries to get rid of the stain by rubbing it off with his shirt, and that is when the spirit of Sai emerges and enters Hikaru's mind. Freaked out by this, Hikaru faints. As Hikaru gets to know Sai better they become close friends and Sai teaches Hikaru how to play Go like a champ. Hikaru trains so that he may catch up to his rival, Akira Touya, who is a Go prodigy, while Sai wishes only to attain "The Hand of God" (kami no itte). The above description came from Emily and Li Lin, and was edited by yours truly (contact me).